My mother always told me that it was not good to scratch a scab, because when it itches it is a sign that it is getting better. Well, I couldn’t reach the itch on my left ankle, and, as far I could tell, it wasn’t getting better. And it was quite a sharp itch. So I asked Jackie to investigate. She found a mosquito bite, and treated it accordingly. The pain in my knee doesn’t usually disturb my sleep. Last night it did. Perhaps that is why I have been very drowsy today. During mid-afternoon, slumped in a chair, I occasionally nodded off, failing to hold onto my book, which drew my attention as it slid to the floor.. I do apologise to Martin Amis, for being less than rapt by the last lines of ‘Einstein’s Monsters’, his collection of short stories. Once I pulled myself together, I did appreciate his at times, muscular, at times reflective, writing. Four of the five tales had been published elsewhere before they were collected into this group in 1987. The debate about nuclear weapons that Amis, in his introduction, ‘Thinkability’, describes he enjoyed with his father, still rages today, when Kingsley’s views would seem to dominate. Martin’s well crafted pieces span eras before and after his anticipated man-made catastrophe. This morning I received a phone call from Lymington Hospital offering me a cancellation for laser treatment to my left eye on Friday. The ensuing conversation was entertaining. I began by explaining that I would be happy to attend if they fast forwarded my recovery time from the knee surgery. Otherwise, my day involved unsuccessful attempts to sleep; reading; and looking out onto rather overcast skies shrouding a damp garden. I am still trying to take it easy. Among the blooms covering the trellis in the front garden are those of a most fragrant pink rose. Jackie has placed one in a vase on the windowsill beside my corner chair. The photographs also contain my dosset box which, in theory, helps me to remember my medication times and dosages. At the end of a fairly dank afternoon, we received a delivery of two chairs from ‘Handmade From The Heart’. Jackie photographed them on their decking platform. The Rose Garden lies beyond the decking. Fearing that some of the new roses would perhaps fade before I could reach them, Jackie, who wanted me vicariously to enjoy the sweet scent of ‘Twice in a Blue Moon’, photographed that, too. This had been our witty daughter’s wedding present to us last year. In order to take it easy today I determined to stay indoors and not be tempted outside. This was not expected to be difficult because it was supposed to rain all day. Although the skies remained overcast, there was very little rain. Helen paid us a visit this morning, and we exchanged our respective news. Much of the rest of the day I spent dozing and reading. Aharon Appelfeld, who died earlier this year, was an Israeli author who, as a survivor of the Holocaust, focussed on the rise of anti-Semitism in Europe. 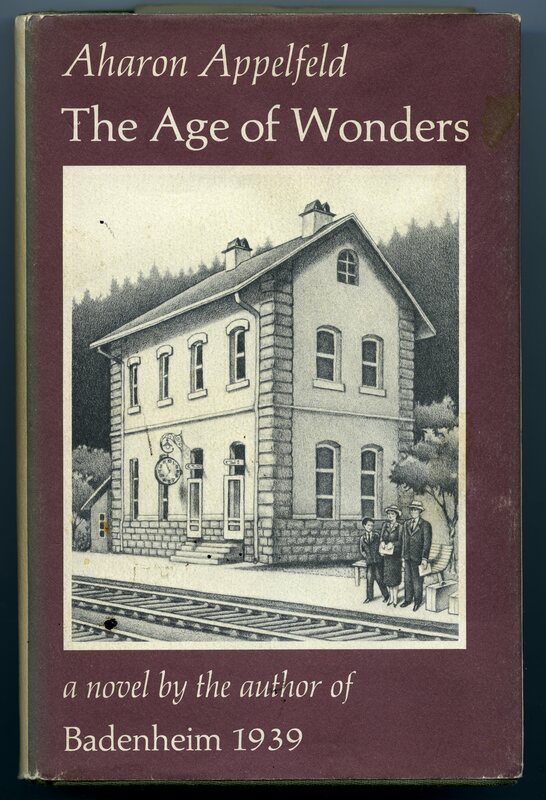 His novel ‘The Age of Wonders’, which I finished reading this afternoon, is a beautifully written narrative from the perspective of a twelve year old boy. As usual, I will not reveal the story, save to say that the work offers a gradual realisation of the pre-war build-up of alienation of Austrian Jews. The writing is simply fluid and full of excellent lyrical descriptions. A most apt recurring motif is the family train journeys from 1937. This is reflected in Nancy Lawton’s jacket illustration for my David R Godine publication of 1981. The beauty of Appelfeld’s prose has been successfully rendered by the translation from Dalya Bilu. CLICK ON ANY IMAGE TO ACCESS GALLERY, INDIVIDUAL MEMBERS OF WHICH CAN BE VIEWED FULL SIZE BY SCROLLING DOWN AND CHECKING BOX AT BOTTOM RIGHT. A combination of my own slumbering stupor and a hot, humid, largely overcast, day presaging the predicted thunderstorm caused me to doze the day away. Jackie, however, prepared Mum’s perching stool, and bolstered one of the wooden chairs, so that, first from the perch, and then from the chair, I would have an opportunity of focussing, to some extent, on that little corner. My choice of the selection of supermarket ready meals Jackie has kept in stock for these crucial days, was tasty cannelloni. This was followed by vanilla ice cream. I won’t dwell on the agonies of transferring myself, stiffened after an hour’s drive, from the car to our living room; adjusting to the different seating levels, and manoeuvring myself around the home yesterday evening. Two examples will suffice. While Jackie was in the kitchen preparing wonderful scrambled egg on toast, I decided to rise from the old worn out Chesterfield sofa which was my favourite TV seat. When Jackie returned after twenty minutes she had to put the tray down and haul me up to the arm of the furniture. I was dripping with sweat, but that didn’t stop me relishing all my dinner. The most frightening challenge had been ascending the stairs to bed. Having eventually summoned up the courage to give it a go, I surmounted these with comparative ease. Our bedroom is part of an extension added in the 1970s. 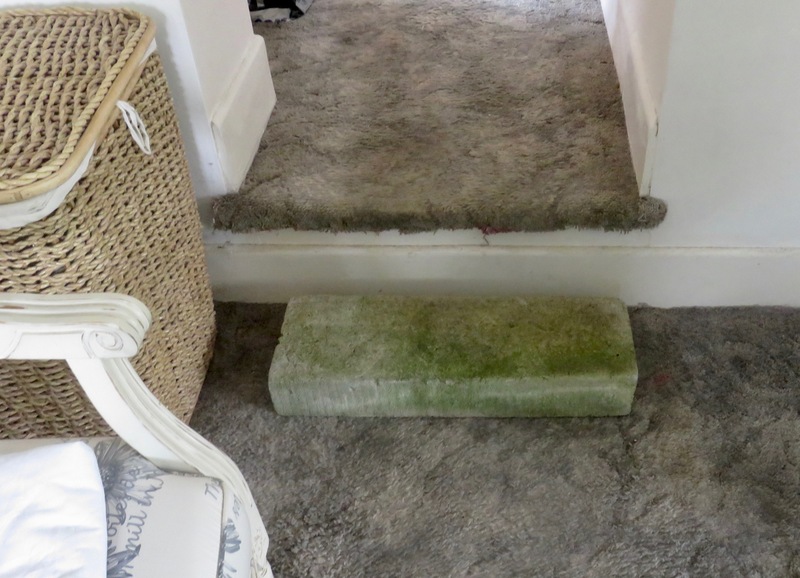 There is a further step down into it, twice the depth of those on the stairs. 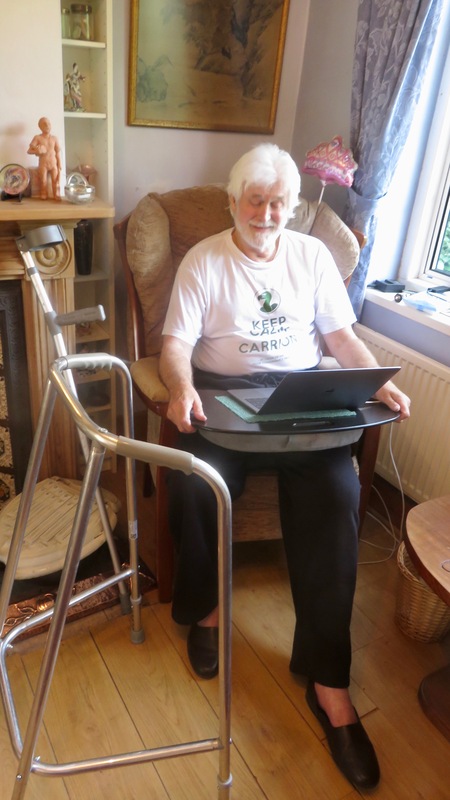 Still using crutches, I fell down it, tottered forward and came to a standstill, realising that my replacement knee had twice taken all the weight, with no adverse effects. This morning, we pondered how we might insert an intermediate step. Having provided me with coffee, Jackie wandered around the garden. Soon I was greeted by her smiling face beside a slab of concrete resting on her shoulder. Would that I could have snapped the moment. I was soon able to step on it and descend the stairs. We will have to be satisfied with a photograph that the Maintenance Department produced later. Having given me a personal cleaning service Jackie felt I was really home once ensconced in my corner chair. Note that I am wearing my more familiar slippers. I slept through most of the afternoon. Later, I really looked forward to my dinner of fish pie, carrots, peas, and green beans. It was eaten with considerable relish.